Trek put out a bulletin saying to always run a 5mm spacer ON TOP of the stem with their carbon steerers. There are two Trek madone frame fits: the pro and the 'performance'. The performance has this amount of spacers stock from the factory. 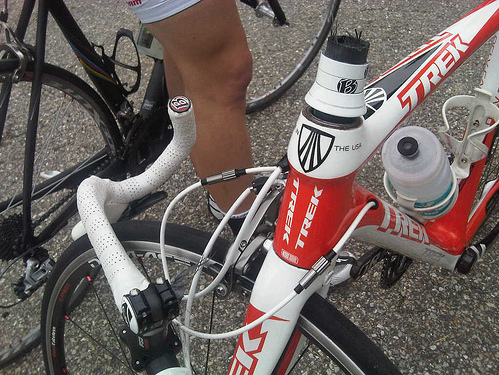 It also looks like an FSA stem, which Trek specifically says not to use, cause this can happen. This was another one of the Haymarket/Homevisit team Madones that broke at the steerer during the '10 season. Don't think that was in the CAT 5 race, though. from what i remember hearing, it was at the start of the race, pulling on the bars and starting to pedal and snap. Low speed, no injury. it was the P12 race.